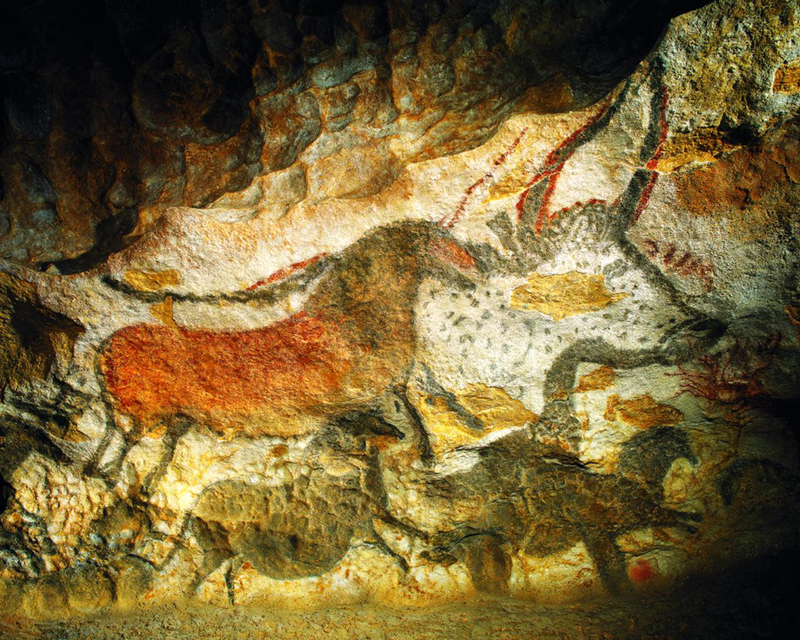 Seventeen-thousand years ago, a group of people very much like us descended into a cave in Magdalenian Europe and began painting animals on the walls. We can hardly know what drove them, although we enjoy pondering their motives. 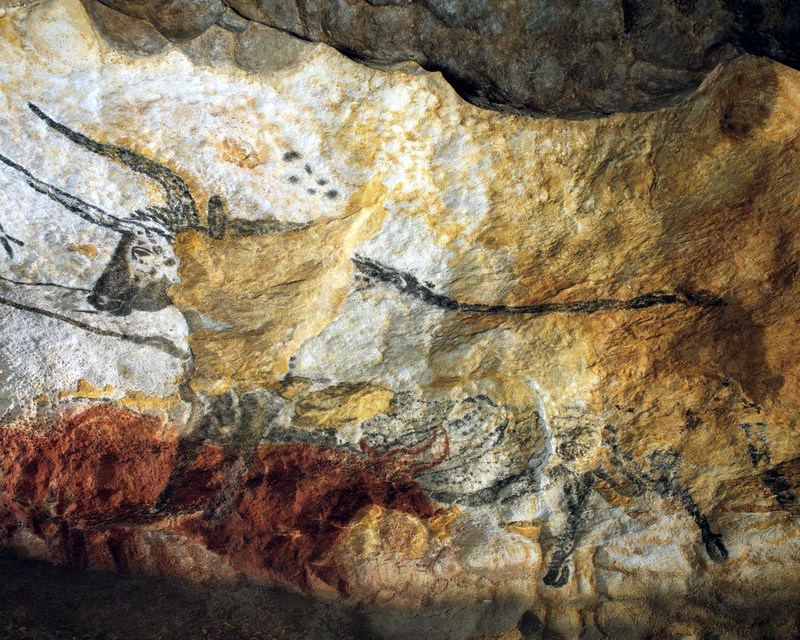 Caves, like the one at Lascaux, had been decorated at least since 30,000 years ago — as at Chauvet caves to the east of Lascaux — but it is Lascaux that has most captured the world’s imagination. Tourists came by the thousands to walk through the galleries and be awestruck. That is, until their very enthusiasm began to endanger the drawings. 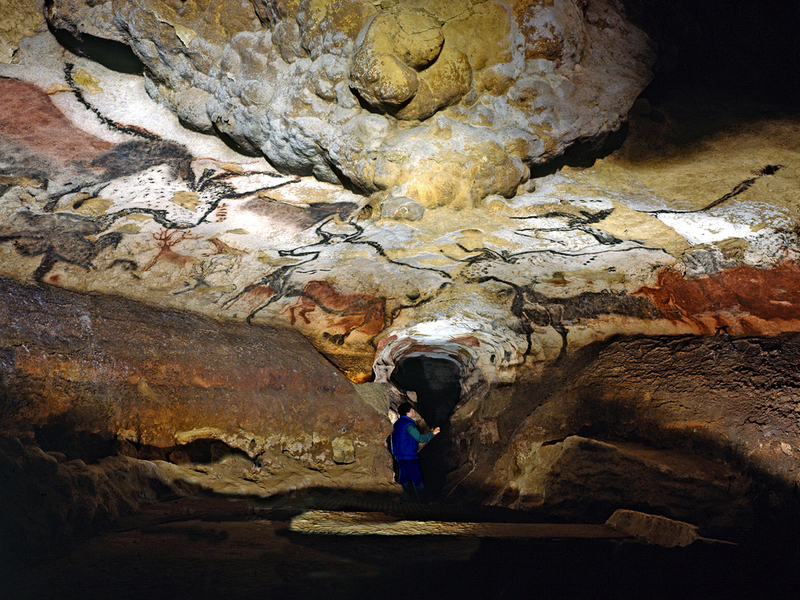 Now, tourists come to see the replica of the caves at an attraction called Lascaux II. My wife and I had been to France many times. We had visited most of the great cathedrals of northern Europe, from Amiens to Rheims, and had made pilgrimages to sites like Mont St. Michel and the Impressionist Eden where Claude Monet painted at Giverny. We had gained a profound education in the long line of history and culture that informs who we are today. Carole likes to look into the old family photographs to see the physiognomic evidence of her genes, dating back to her great-grandfather, Rowan, who fought (on the losing side) in the American Civil War. She searches old genealogical records to carry that family history back further into time, at least back to the 18th century. 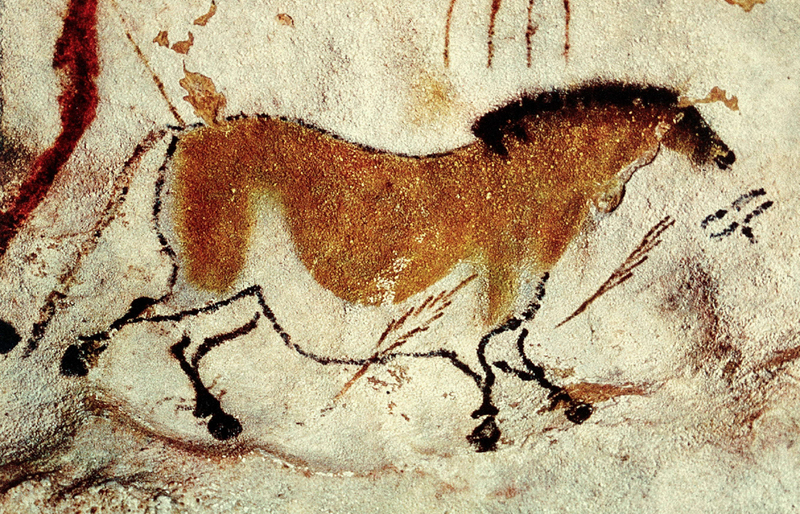 For her, as an artist, looking at the bulls and horses of Lascaux is very like seeing the ultimate and oldest family photographs. 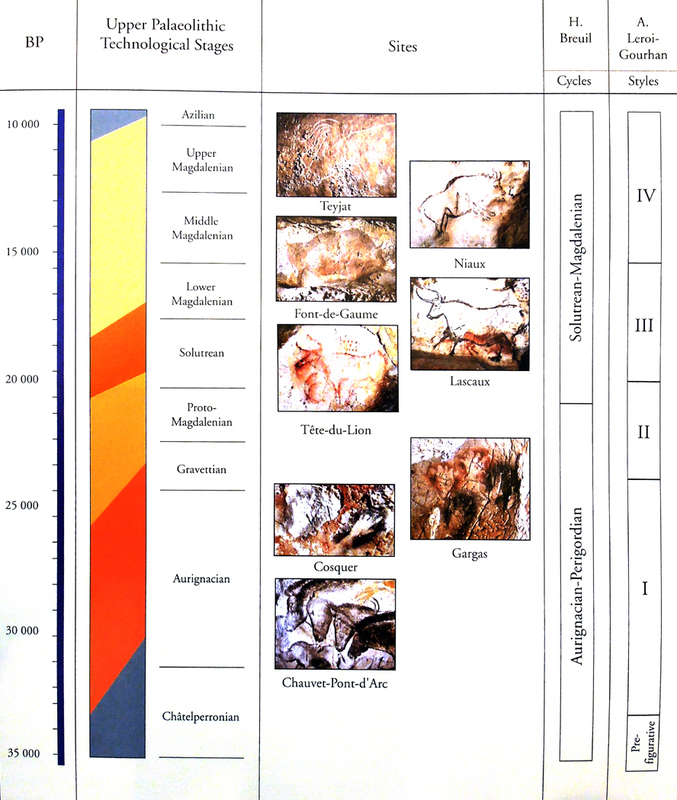 This is where our histories began, or at least, where they were first recorded, in the cave paintings along the Vezere valley from Montignac to Les Eyzies. 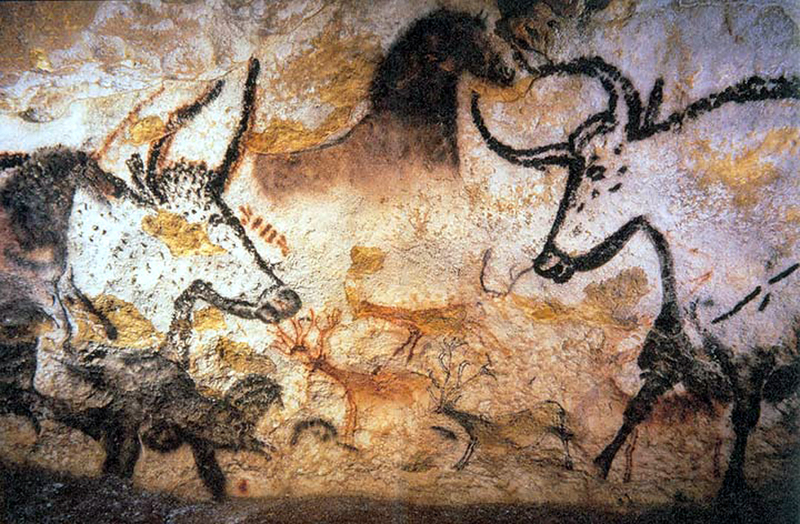 And, although Lascaux II is a reproduction, and not the original, it can carry the same potency that a reproduced family photograph can have. It is the pith of the image that carries the wallop and not its provenance. Seeing the imitation still gives us something that images in a book cannot convey: the size, the architecture, the surface. And it gives us a fighting chance to imagine ourselves in the caves before the development of writing, governments or digital watches. We can feel in our hearts the atavistic rumblings. That this is an act of imagination rather than a literal case is not only not a detriment, it is a positive improvement: Imagination is the source of everything here and that has come after. We would hardly be human without it. 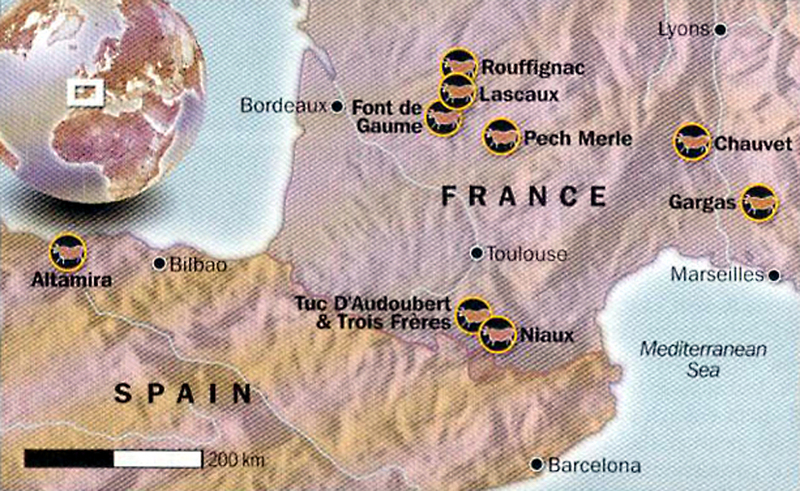 We found the billeterie and bought our tickets for Lascaux II and were told there was an English language tour at 11:30 a.m. Lascaux II is about a kilometer out of town, up a narrow road and a narrower driveway, with lots of cinder parking lots at the top. We waited where we were told to wait, and about 20 others joined us until a young man with balding hair and a flashlight came out and welcomed us in English with a characteristic French accent. We walked down a flight of stairs into an underground chamber that had a dozen or so museum-style exhibits describing how the cave was discovered, how it was formed geologically, and how visitorship had damaged the original caves, and so a new reproduction was created for visitors, out of concrete, measured, millimeter by millimeter from the original. 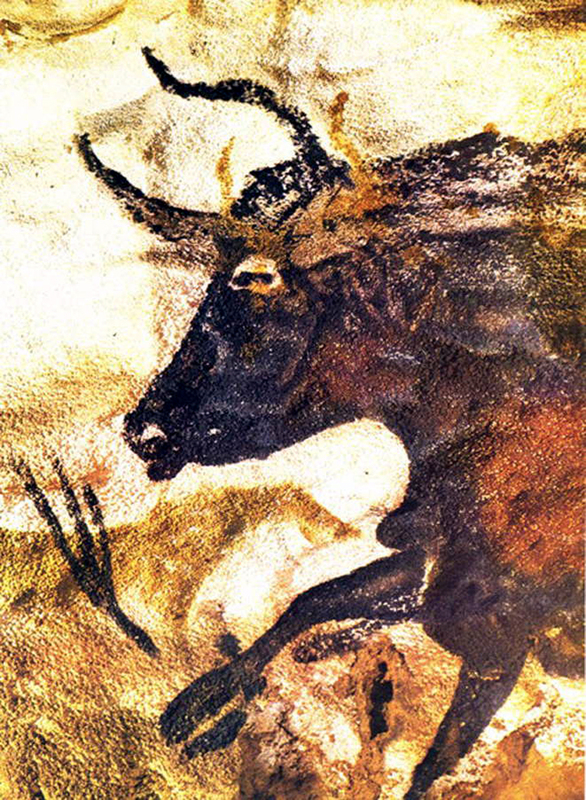 Two of the largest galleries were recreated in Lascaux II, including about 80 percent of the best animal drawings in the cave. He led us into a darkened cavern the size of an auditorium and on both walls we saw animals, beautiful animals drawn, some smaller than lifesize, some, like the great 18-foot-long taurus, larger than life. 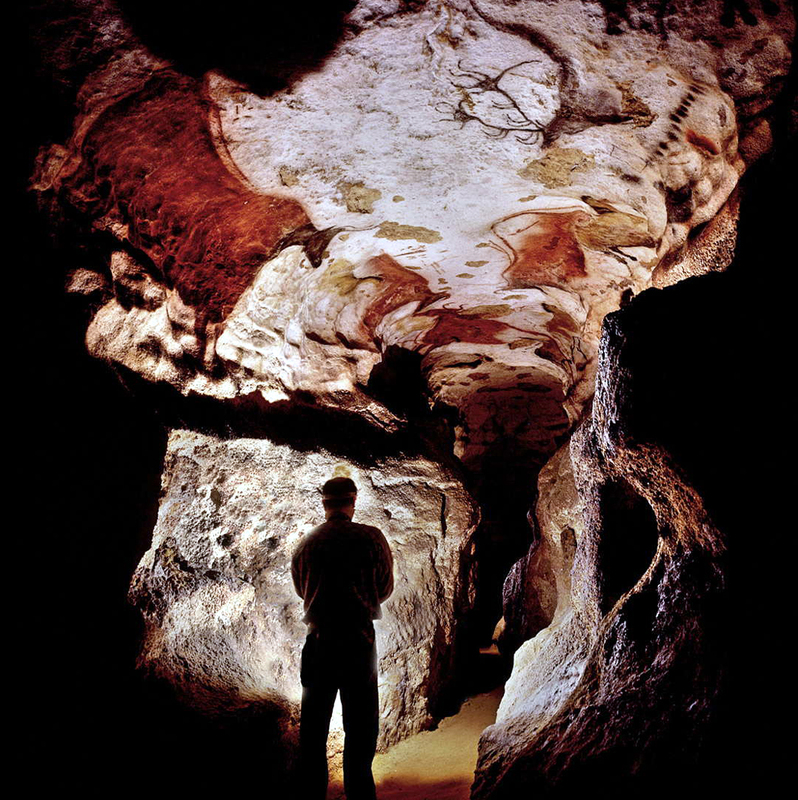 The bottom of the cave was “wainscotted” with clay, and no drawings were made on the clay. “You cannot paint on clay,” our guide said. There was also a figure the guide called a “unicorn” at the very entrance of the cave, although why it was called a unicorn, I don’t know, since it clearly had two horns blazing out of what seemed like a lion’s head. Carole immediately spotted it as a shaman wearing an animal hide and carrying two sticks, like the African deer dancers we have seen pictures of. “The first figure, as we entered the bull room, was not the most impressive — the big bulls were — but the first figure is something you work your way back to after recognizing what the other figures are,” she said. “The first figure is mysterious and it isn’t drawn with the same confidence as the bulls and horses. There are not the same strong completely informed curves. The first figure looks like a man with black legs whose back and head might be covered with a lion skin. In place of his head is a lion’s head, with what looks like two long, straight horns protruding from the temples. I think those two prongs were not horns, but were sticks the man was carrying. It looked like the sides of an animal skin were hanging down on both sides from the man’s torso, if he was a man. “Our guide showed us what he called a ‘hump of fat’ on the man’s back, like the hump of a bull, or maybe a grizzly, but I thought it was the lion’s mane. It wouldn’t have been practical to make something there like a lump of fat, if the man were wearing a costume. Perhaps he was driving the animals in the cave in a kind of cattle drive. The animals, especially the horses, tended to be drawn in series, and at least one series — “like a musical phrase,” Carole says — shows them advancing from a standing horse, through a walking horse to running horses. The horses were finely seen, with astonishing attention to anatomical detail, allowing for a certain amount of distortion, like the distended bellies on several of the horses, and legs rather shorter than their bodies would have had. Still, the attention to joints, hocks and fetlocks was surprising. 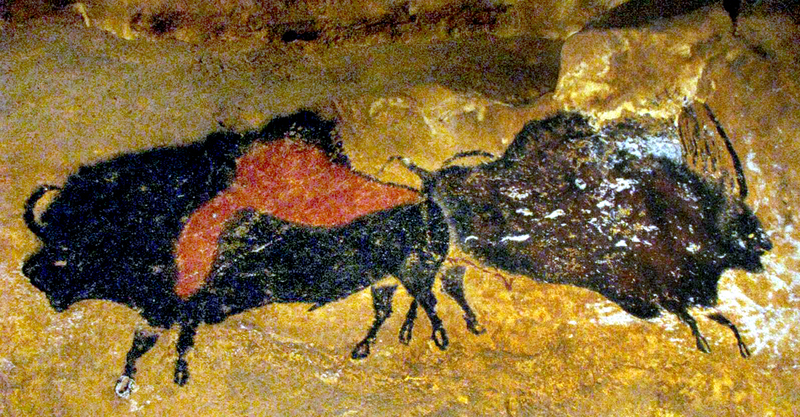 The bulls, much larger and drawn above and overlapping the horses, were often just heads and shoulders. Some had the curved backs and bellies and jaunty forelimbs racing out front. But although they also showed keen attention to anatomy, they clearly were meant to impress with size and energy. You can see why they might say so, for the animals, all drawn with care for detail and expression, were everywhere. “Our guide gave a running commentary and explanation of what we were looking at, but I tried not to hear him and tried to pretend that I had accidentally found it, so I could feel it only visually,” Carole said. “I thought the most beautiful drawings and paintings were the bulls. They had wonderful curved horns, like Picasso’s bulls, but their heads were more prominent and really beautiful. Beautifully shaped and beautifully drawn. On at least one bull’s face, the detail of the nostril and the mouth were indicated by negative space against a black muzzle. “If I had been alone, and obeying my instincts, I think I would have skipped and danced and clapped my hands, in a circle, round and round and round in the round room, just happy because of the bright contrast and the strength of the animals, and the joyous beauty of them running together, overlapped and contained within. “There were little runs of horses like musical phrases. Despite being so realistic in so many ways, they are also somewhat stereotyped: the same horse shape from the same side angle. The same bull head over and over. But there was one exception: At the end of the chamber, in a darkened corner where the passageway was bifurcated and narrowed, there was what looked at first like an upside down horse. “Perhaps they thought it was Australian,” joked our guide. “Or perhaps it had been killed and was dead,” he said. But a dead horse is not upside down like a cockroach, but flat on its side. No, this horse seemed to be dust-bathing, rolling back and forth on its back, almost playing. 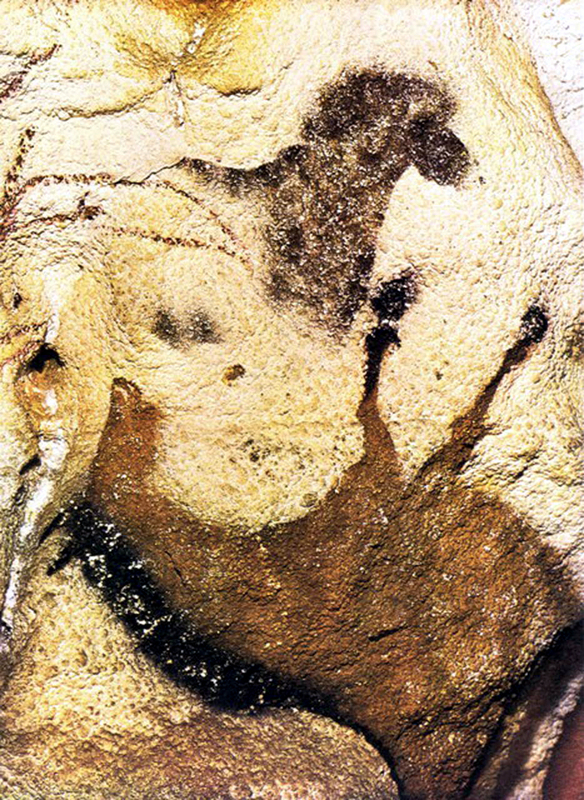 Alone of all the paintings we had seen in the Lascaux II galleries, it seemed to be an artistic rendering of something the artist had seen in the real world and was drawn not because of its totemic meaning, but simply for the pleasure of rendering experience, of seeing the world. 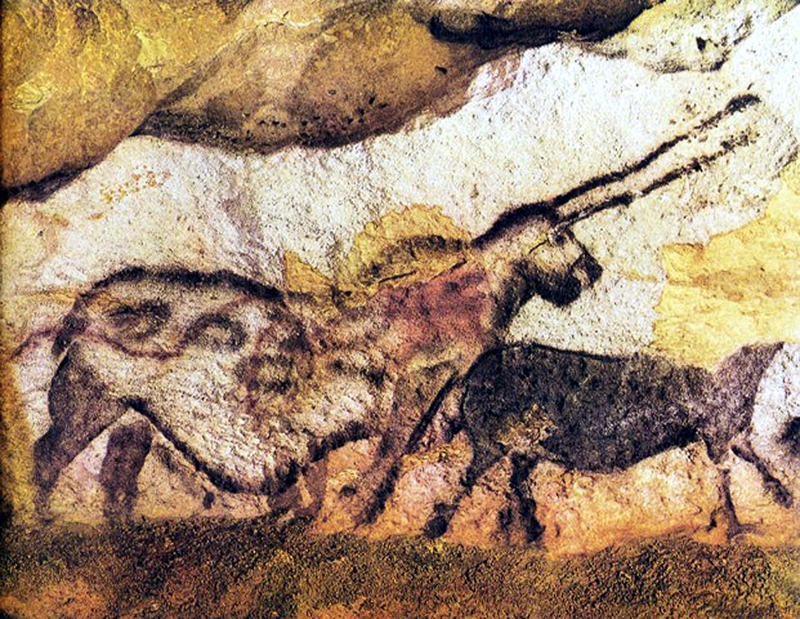 Lascaux II was a decidedly more satisfying experience than the Font-de-Gaume paintings: The animals were better drawn and they could be seen with a clarity missing in the other cave. There was a joy to the energy of the animals racing and jumping; you could hardly fail to be exhilarated by them. And seeing them in situ — even in a reproduced situ — gave you a much deeper understanding of them compared merely to seeing the photos in a book. Some of them are giant, like the 18-foot bull, a scale you can’t reproduce in a halftone. 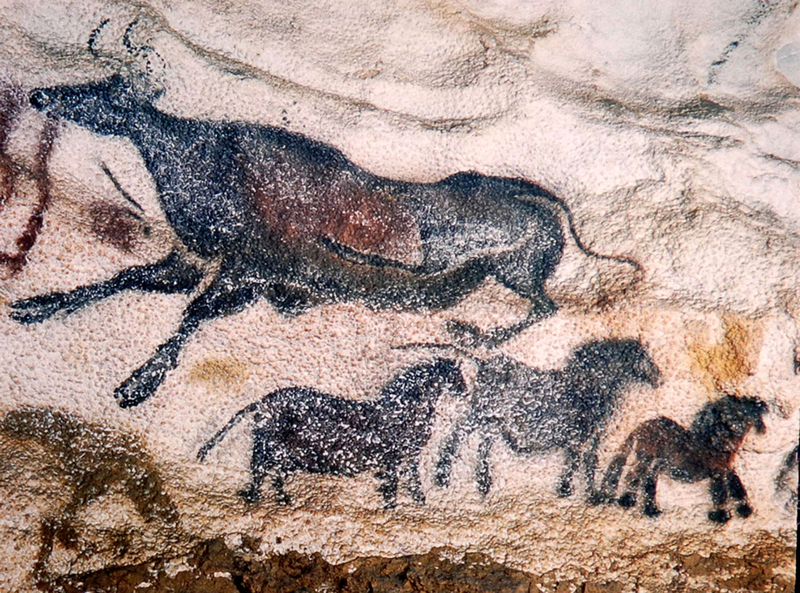 They are some of the most astonishing drawings I’ve ever seen, even if they are 17,000 years old. For Carole, as always, they hit with a more personal note. “Maybe one reason I love these paintings and this experience so much is that I’ve made this paint myself, many times, beginning when I was about six or seven years old, in my back yard. There was plenty of iron oxide red dirt, plenty of yellow ocher clay and always charcoal from the place where we used to build a fire and roast oysters. “I regularly made mud pies out of the red dirt and yellow clay and set them out on the back steps to dry for my playhouse bakery. The stain that the red mudpies left on the steps would not come off, no matter how much I washed it. So when Daddy had the men in his plumbing shop paint the back of our house white, I couldn’t wait for the white paint to dry; I pestered my parents about when the paint was going to be dry and unfortunately, they didn’t think to ask me why I was so interested. As soon as it was dry, I mixed up a bucket of red dirt and water and got a window sash brush. I used the step ladder and painted everything I knew how to draw all across the back of the house, as large as I could and I signed it with my name. “I asked Mother and Daddy to come out and take a look at the wonderful thing I’d done. Daddy was not pleased and I was sent back up the stepladder with the same bucket and soapy water, but it never came off. Eventually, we painted the back of the house white again, but some of the red still bled through. “And all I really learned from this was that that red dirt must be one of the most powerful things in the world. It made me love it more. “I’ve written a lot of poems about that red dirt. When I went barefoot, it used to stain my feet. The red water it made in the bottom of the bathtub was beautiful, running toward the drain. “I still love the range of contrast that you get from this velvety black, strong iron red and buttery yellow ocher. There were cows the color of yellow ocher that used to sleep in the grass on the river road past our house. When the grass in those fields turned lion colored, the cows were camouflaged. In the summertime, thousands of orange day lilies filled the same pastures. These insights are so Carol, I can hear her laughter. Well said.